People are spending more time on Google properties these days, widening the wedge between the search engine and one of its closest competitors -- Facebook. Brian Wieser, senior research analyst for advertising at Pivotal Research Group, points to a widening gap in the consumption rate for people using Google versus Facebook. 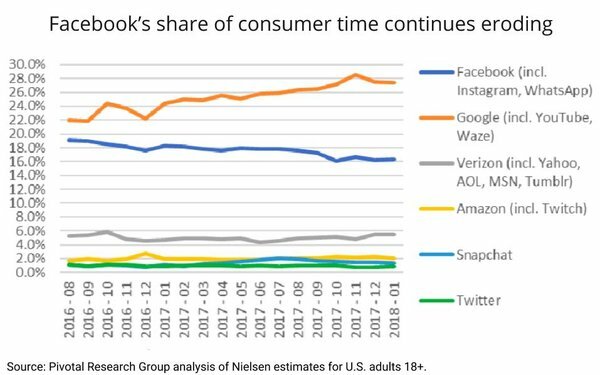 Analysis of updated data on digital content consumption ratings from Nielsen for January 2018 shows ongoing growth including substantial growth in the share of consumer time for Google properties from search to Waze, and continuing erosion in the share of consumption time for Facebook, Wieser wrote. Pivotal Research uses Nielsen’s DCR to monitor the consumption on digital media, such as handsets, tablets, desktop computers and other personal devices within the U.S. by audiences 18 years of age and older. Google’s YouTube, Google and Waze combined to account for 27.4% of all time spent on digital media. YouTube continues to grow its consumption of more than 20% year-over-year monthly. Other Google properties expanded by more than 33%. The measurements include time spent with content tagged with a Google URL, which would also include AMP-delivered content for other publishers’ properties, he wrote. Facebook lost 5% in aggregated time spent despite an increase of about 4% in users, which reflects an 8% decline per person. Instagram -- which represents around 10% of use for Facebook’s core property -- performed better with a gain 22% of time spent on the site, gaining about 14% more users and 7% increase in time per user. Including Facebook, Messenger, Instagram and WhatsApp, Facebook’s share is now at 16.3% share vs. 18.3% in the year-ago period. Verizon-owned properties such as Yahoo and AOL held a “solid No. 3 position in the industry,” increasing 5.5% sequentially. Amazon, including Twitch, accounted for 2.1% in January 2018 versus 1.9% in January 2017. And while consumption rates are not directly related to monetization in the near term, he wrote, these changes demonstrate the appeal of different platforms to consumers that indirectly impact advertiser sentiment that ultimately provide increases or declines of longer-term growth. “Total digital consumption amounted to approximately 31bn person-hours (or 27bn excluding YouTube), which compares with the approximately 44bn hours of total video consumption across all devices that occurred during the same period, or around 35bn of conventional live + time-shifted TV set-based consumption among the same audience,” Wieser wrote.